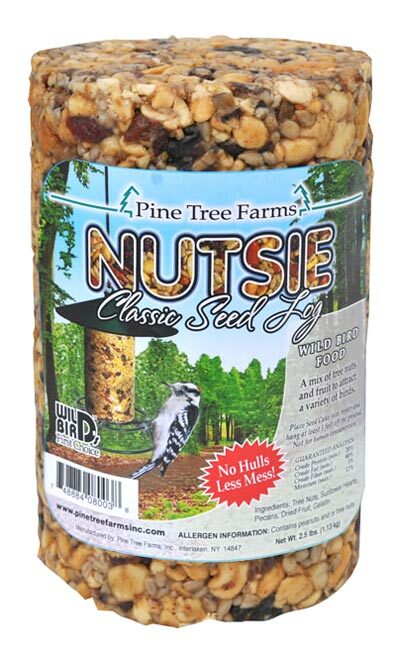 Offer nut-eating birds a fun treat with the Pine Tree Farms Nutsie Classic Seed Log. This innovative blend of nuts, sunflower hearts, and dried fruit in a log form adds a new element to your bird sanctuary. The nuts are already hulled, diminishing waste in your yard, and the sunflower hearts and fruit are favorite treats of songbirds. Gelatin helps the item maintain its form, keeping your garden neat while offering birds a wealth of food. Install this log onto your existing Pine Tree Farms Classic Seed Log Feeder (not included), and hang it in your garden for simple placement. Go crazy for bird feeding in a new way with this Nutsie Classic Seed Log. Made in the USA. Note: This case pack includes 12 Pine Tree Farms Nutsie Classic Seed Logs, 2.5 lbs. each.